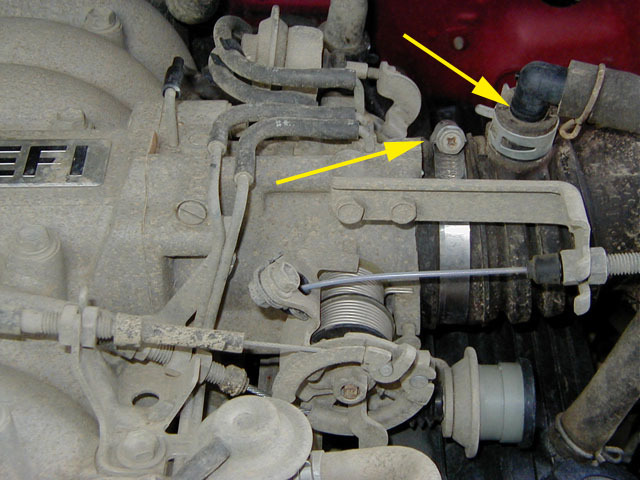 The throttle body on a Toyota fuel-injected engine contains a butterfly valve which opens to allow air into the intake chamber atop the engine when the throttle is open. 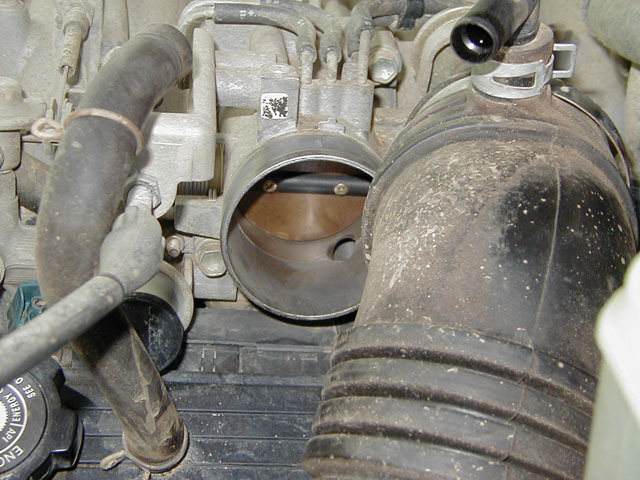 The throttle body is fed from the air intake, and after years of use, the particles which get past the air filter can impede airflow, cause idle to drop, or affect the opening and closing of the valve. It's a good idea to clean the throttle body at the first sign of performance or mileage decreases, and as semi-regular maintenance: I clean mine at every 30,000 mile service. 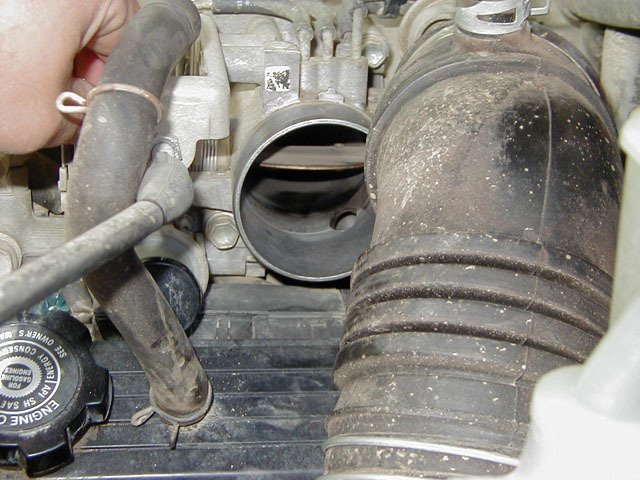 Removal of the intake is straightforward: simply remove the clamp on the intake at the throttle body, and the valve vent hose. Open the butterfly valve with the throttle linkage and spray cleaner into the throttle body. To clean the throttle body, use a screwdriver to remove the hose clamp on the intake, and also remove the vent hose from the intake tube. 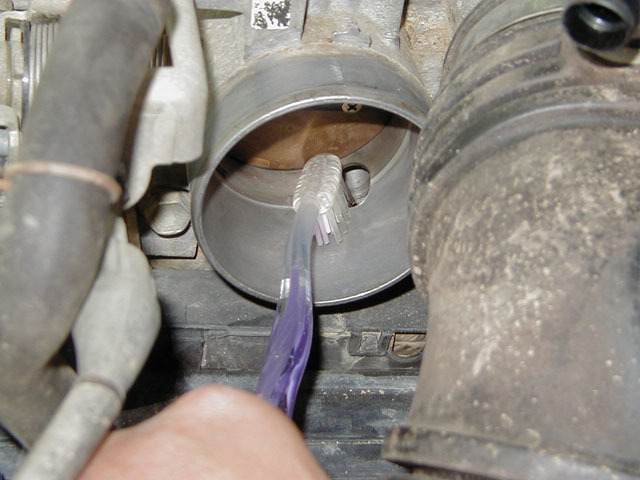 An old toothbrush is ideal for cleaning the throttle body, as it allows you to reach inside and work around the valve. After spraying the cleaner inside, I used an old toothbrush to "scrub" the inside of the throttle body. The toothbrush allows some reach further into the assembly, and it also enables working all around the valve mechanism to remove deposits. I periodically soaked the toothbrush with carb cleaner to remove the grime - or to stop spreading the grime created. The throttle body is clean and ready for reassembly. Once the scrubbing is complete, wipe down the assembly with a clean lint-free rag and reassemble the intake and vent hose, and start the engine!